This is a steam locomotive for a small railroad in Era III. 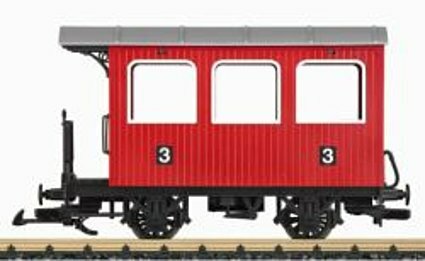 It was designed for light narrow gauge railways and was built in large quantities by Orenstein & Koppel. Such small steam locomotives and others like it were used on narrow gauge industrial, logging, and other light railroads. The LGB model is richly and finely detailed as well as extensively lettered. The motor and gear drive have been reworked compared to earlier versions of this model. The side rods and valve gear are fully working details. Also, both axles on the locomotive are powered. In addition, the model has a figure of a locomotive engineer and an engineer’s cab closely based on the prototype. Length over the buffers approximately 21 cm / 8-1/4″.